A remarkable video capture of an Interior Fire Attack & Search Above Fire by Stockton Firefighters. Stockton Firefighters responded to a working 2 story, single family dwelling on fire on Chatsworth Circle on June 30th, 2018. The video also includes a dog rescue. Crews arrived on scene to heavy fire conditions with exposures threatened, and requested a second alarm. The video capture begins by following one of the crews deploying and advancing a 2 1/2 in fire hose line. Considered ‘Large Water,’ the 2 1/2 in is high volume but difficult to maneuver. By advancing directly into the house and towards the rear of the structure, Firefighters were able to knock down heavy fire in a short amount of time. The fire burned so hot, it compromised most of the windows in the structure allowing smoke to leave and light to enter. With the wind at the back of the firefighters, this video capture provides a rare glimpse into what firefighters must deal with. Most structure fires have little or no visibility due to the smoke trapped inside the building, but this video shows everything so clear- it seems unreal. Though the visibility is clear and hose lines are in play, the video does not depict the remaining extreme heat from the fire. As firefighters on a hose line make ‘a knock’ on the downstairs fire, the video capture switches to a Truck Company entering the structure to search for life. The crew passes the nozzle team and heads up the stairs. The search team is able to clear two rooms quickly before the fire begins to roll over their heads. The final video capture follows two firefighters who move quickly to stop the fire from spreading to another house, and save a dog trapped in its cage. This fire happened to occur on June 30th; 7 years to the day that the Stockton Fire Department was forced to close apparatus, reduce staffing, and lay-off 30-some firefighters. Since then, the fire department has maintained daily staffing equivalent to the 1970’s. Though other city departments have been restored to their pre-bankruptcy levels, the fire department continues to make due with less. It is an increasing challenge- as population, call volume, and other variables grow annually. The Stockton Fire Department is, in fact, the busiest that it has ever been. So much so that if two incidents were to occur at the same time (along with the standard number of occurring medical emergencies), the City would be stripped of all of its fire department resources. This happened yesterday. As firefighters worked to extinguish this house fire and stop it from the very real potential of spreading to other houses- a large grass fire and other medical calls taxed the rest of the fire units in the City. Stockton was forced to request mutual-aid from neighboring agencies as far as Tracy. If a second structure fire or other large incident were to occur in addition to this (which the law of averages will eventually dictate), there is the very real possibility that there would be NO units available to respond. Our Fire Department Administration works diligently to add ‘Enhanced Staffing’ for the week of 4th of July. The hot weather, fireworks, and other activities that occur this week make it one of the busiest weeks of the year for the fire department. Busier that the rest of the year, and the rest of the year routinely triples the call volume of the national fire service average. June 30th also marked the half way mark for the year, and the department continues to be on pace to match last years totals (47k to 48k emergencies)- which was the busiest year in the history of the City of Stockton. Stockton Firefighters remain diligent. Working three times as hard as the national average to keep emergencies mitigated and serve the citizens. As the fires become more frequent and the call volume continues to increase, we will continue to do what we can with what we have. The extra staffing is only for one week, even though we continue to be in desperate need of it all year long. The Stockton Fire Department is committed to providing excellent emergency and non-emergency customer service. Our dedicated members ensure a safe community through public education, prevention, and aggressive suppression and rescue activities. 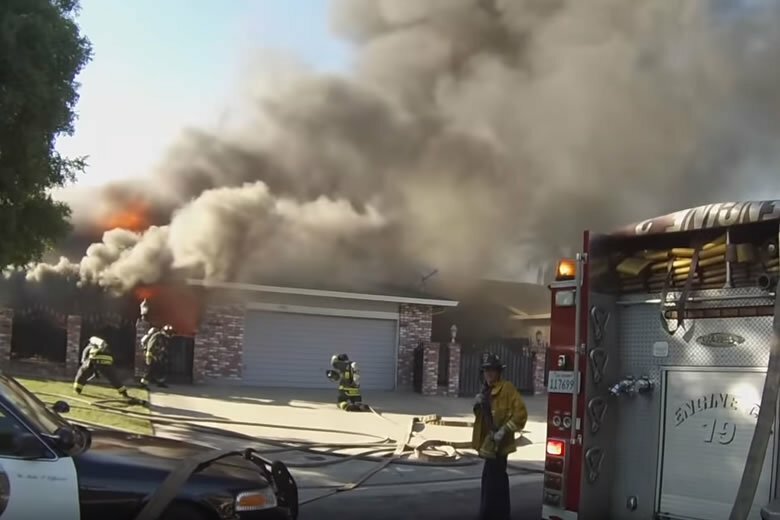 Interior Fire Attack & Search Above Fire video published with thanks to Stockton Firefighters who are proud to protect and serve the city and citizens of Stockton, California since 1850. ‘StocktonFireHistory’ acts on behalf of Stockton Professional Firefighters Local 456 & the Stockton Fire Department Historical Society.